I love to try new things. Well, usually. The lavender soda was very interesting. It was more so a lightly flavored seltzer water. It smelled great, as most lavender things tend to do. The fizz was great, but there wasn't much of a taste. I think it was designed mostly for looks. I won't complain though, because I feel super classy sitting in the library sipping on one while blogging and listening to The Grand Budapest Hotel soundtrack, which you can stream here. It's fantastic, by the way. Alexandre Desplat does it again! So you enjoy that soundtrack. 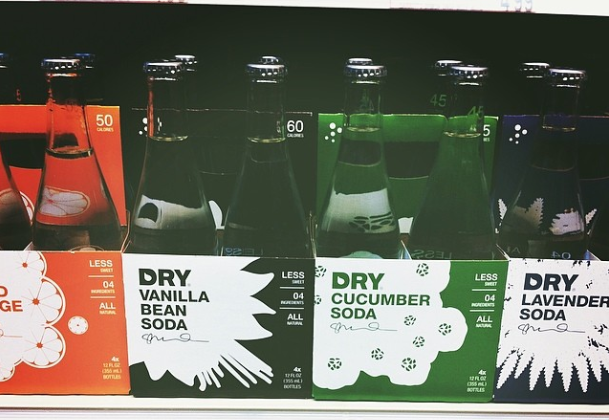 Go get your favorite drink, or even go try one of Dry's fancy flavored sodas, and relax. It's St. Patrick's Day, and you deserve to take some time off your feet and be at peace. Oh, and the empty bottles make great flower vases!